I haven't really been blogging lately because I haven't had much time to knit this term. I sort of always feel like blogging is only worth doing when I have an FO to show because how boring is it to look at pictures of unfinished projects? But then I realized that I love seeing pictures of other people's unfinished projects and then I look forward to seeing the progress they make and so on and since it may be a while before I have another FO to show, I figured I might as well do a jumbled post full of things I am currently working on. 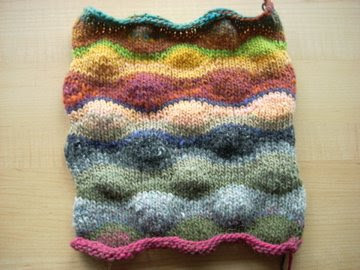 Over the weekend I took all the scraps I had of Noro Kureyon lying around from the Lizard Ridge squares I'm making and I spit joined them all together to make a truly random ball of yarn, and then I knit one more Lizard Ridge square. Don't worry, I won't be offended if you think it's ugly. I then decided that I would knit a Turn a Square hat to use up the remaining yarn, which wasn't enough to make another square. I have a ton of Cascade Eco. Wool sitting around from plans to make a matching hat/scarf/mitten set that never happened and thought the two would pair well together. 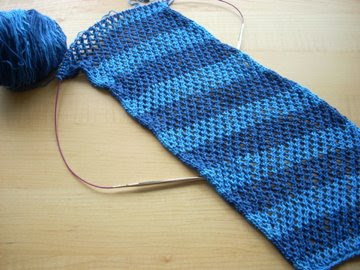 I don't have enough Kureyon to do the 2x2 stripes, so I'm doing a 2x1 stripe. I'm also not bothering with seamless joins because I just put the seam in the back and, well, it's just a hat. I'm also still chugging along on the lace shawl. I've now completed 29 of the 40 body rounds and then I can do the border. Yes, I know, slow progress, but at least it's headed in the right direction. I also started this Montego Bay Scarf (rav link) a while back as a project that I can work on if I have a spare minute before going to class or going to bed, whatever the case may be. I'm using SWTC Bamboo that my sister gave to me a while ago. You may recall this yarn from it's failed incarnation as a Clapotis, but I think this time it may actually make it to the finish line. 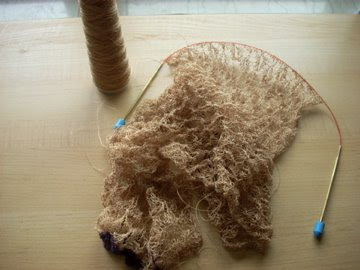 The yarn itself has a really interesting construction. From what I can tell from both looking and pulling it apart, it seems like this yarn is one long, small i-cord. It's super soft, really drapey, and it actually feels cold to the touch! I don't know if I'm going to keep this scarf or give it away, but I can guarantee it'll be loved by someone. ...and that's what's going on in my world. How about you? That square doesn't look as ugly as some of the ones I've made...this will truly be one nastastic blanket! The LR square isn't ugly at all -- I actually think the colour combo is better than some of the originals! I love the lizard ridge square. Random colors are great!! 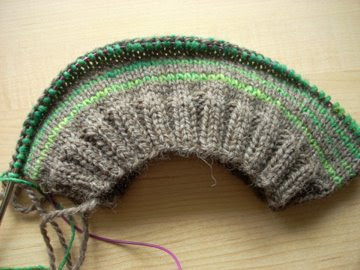 The hat looks like it's going to be cozy, and I like the colors - but there's green involved, so there you go. And your jack-of-all-Kureyons square is in a class of its own, I don't care what the other squares say about it behind its back. That lace shawl is to die for. However long it takes, it will be worth it. I agree there's a lot on your needles right now overall, and given your workload, your productivity is stellar. I just started reading your blog, and quite enjoy it. It will be interesting to see how your WIPs evolve! Mmmmmm, I really like the little square, and it is quite inspirational, I haven't knit squares...I Know I'm a remedial knitter so don't lauhg, but that looks very rewarding so I might get round to that. I've just come across your blog now, and I love the enthusiasm that shows through in your writing. keep it up! What's going on in my world? I am also an undergrad, but I hardly get a summer this year- I am leaving the US in a few weeks to spend a semester abroad in New Zealand! I have already found a yarn store in my college town there.